A first for Global Mission Readiness, Hazardous Materials training will begin in El Rosal, Cundinamarca, Columbia on 26-28 October, 2017. 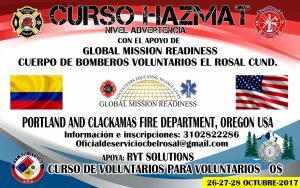 “Volunteers teaching Volunteers” is the theme of this and the majority of our projects as GMR Volunteers from Portland Fire, Gresham Fire and Clackamas Fire will be teaching the basics of hazardous materials response during emergencies. GMR has had multiple training projects in Colombia before and look forward to continuing the relationships that have been established as well as expand the curriculum into HazMat. The three day course will focus on defining hazardous materials, identification, awareness, and decontamination for firefighters. Our curriculum starts out with the basics and expands to more advanced concepts over time. This class reinforces GMR’s mission of self-reliance. Teaching the firefighters of El Rosal, Cundinamarca how to handle these types of emergencies and keeping each other safe, as well as their community, is exactly what GMR is about. A special thank you to the volunteers from GMR traveling for bringing this specialized training into an area of need.